In Nintendogs, use the touch screen to pet and play with your own virtual puppy, and speak into the microphone to give it commands. 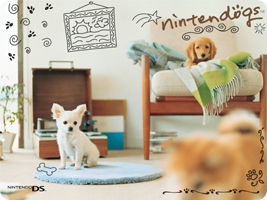 Nintendogs was a huge success for the Nintendo DS, proving very popular with young girls. A number of special editions were released over the years, and a sequel (also featuring cats) was a launch title for the Nintendo 3DS.